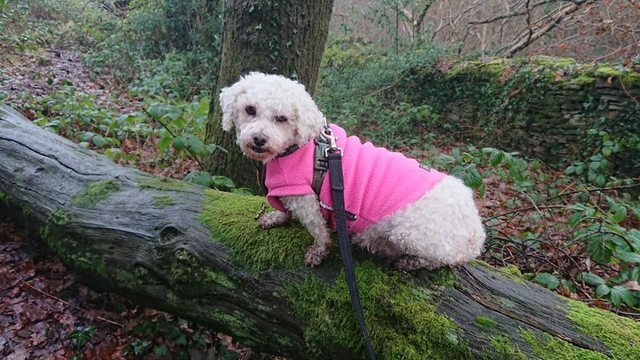 Adorable Rosemary is a 6-year old rosemary Bichon Frise, who is being fostered in Newport. She is a former breeding dog who has made significant progress on the road to rehabilitation. She will need patient owners who will allow her time to build up a bond with them. Rosemary is so much better with people than when she first arrived but she is still a very nervous dog with people she doesn’t know. She will allow her foster mum to brush and stroke her but this has taken many months and may take new owners a long time to build a bond with her. 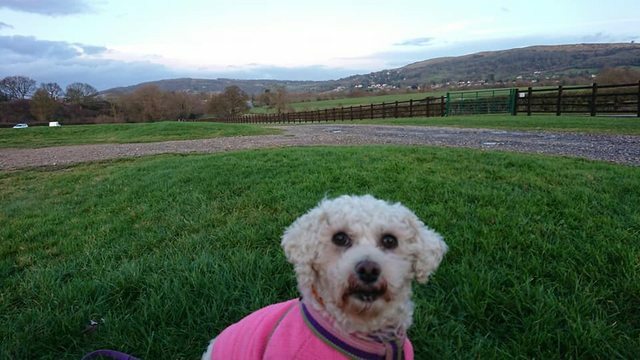 Rosemary adores other dogs and needs at least one to live with for confidence and play. She lives with a variety of dogs in her foster home and is more confident when with them. She is very nervous at meal times and needs to be fed on her own. Her past means she grabs at her bowl and drops food out the bowl to then eat it. Rosemary is fine with cats and currently has two cats in her foster home who she lives alongside with no issues. Rosemary is crate trained and happy to go in and out as she uses it for security when she feels anxious. Her crate training means she travels well in the car. She is fine to be left for up to two hours, provided she has doggie company. Rosemary loves nothing more than to catch up with people she trusts, though does tend to favour her foster mummy, but foster daddy gets lots of cuddles from her when he’s the only choice. She gets incredibly excited when you come home and will paw at you the moment you sit down. As she was so overweight, she likes to be picked up rather than jump up. Rosemary is mainly okay in the house, though does occasionally wee indoors so potential owners will need a ready supply of puppy pads. Being in a home is a new experience for her so she loves to investigate and has chewed through many wires though this is becoming less frequent an event as she works her way through appliances. Rosemary walks well on a lead when she trusts you and will walk beside her foster mummy off lead as she seeks lots of reassurance. When out with her foster daddy, she tends to be a bit less in need of assurance and loves to run and play with her doggie companions. She now is confident with having her harness on which is essential for her to wear in a new home as her nervousness will see her initially run off until she begins to trust you. Rosemary was very overweight initially but has worked hard to lose over 2.5 kg. New owners must be prepared to closely monitor her weight. Other dogs are a must to give her confidence and to continue her exercise. 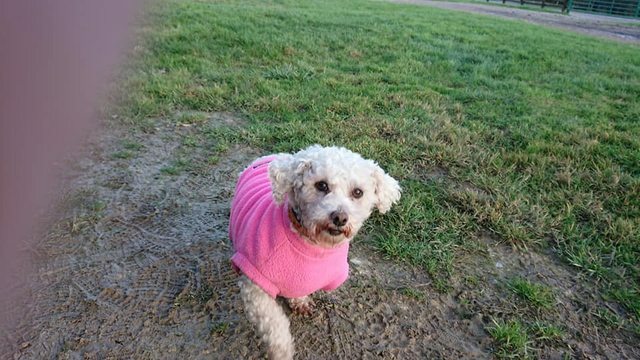 She now walks around 4 miles each day and has eventually started to run with other dogs which has helped her mobility and continued weight loss. Rosemary had awful gum disease through neglect and a few teeth have fallen out as her improved diet began to remove the plaque that was holding them in. She’s had a further seven rotten teeth removed when she had her dental so now has disease free gums and manages her food quite well. 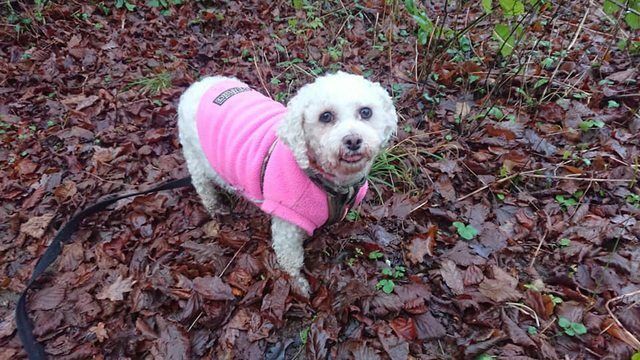 She needs owners that will be prepared to ensure she continues her daily walks with other dogs and that she has a healthy diet and exercise regime. New owners must not expect too much from her too soon and she will need time to settle. Her house must be 100% secure otherwise she’s likely to escape because of her initial nervousness. Rosemary is neutered, chipped, vaccinated and up to date with her flea and worming treatment. Potential adopters will be expected to travel to the Newport area to meet her. If you are interested in adopting Rosemary please read about our rehoming process and complete a Pre-Adoption form ( link here ) and one of our adoption coordinators will contact you for a chat.